BLACK/BLUE. Yesterday’s look: All black with a dash of denim. Super simple, just the way I like it! BOMBER JACKET Carin Wester. DENIM SHIRT Zara (old but similar ones here). JEANS Jbrand. BOOTS Emerson Fry (here). BAG Proenza Schouler ps11 (here). 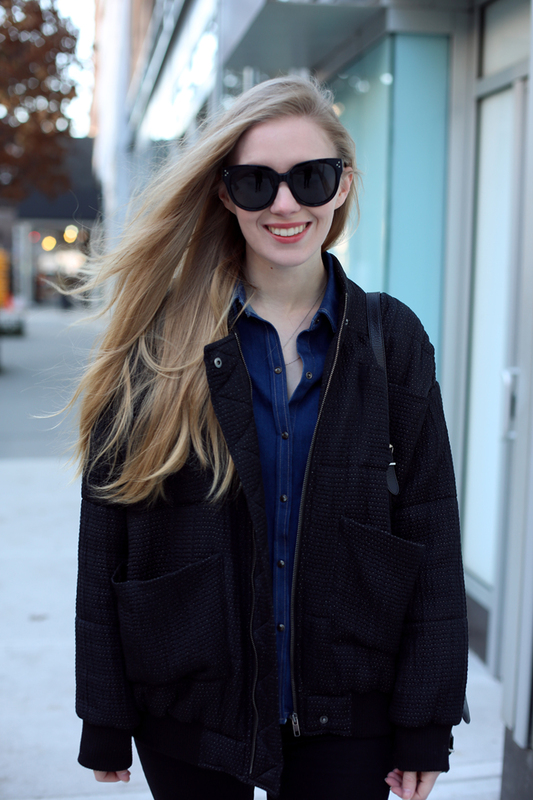 This entry was posted in Outfit and tagged bomber jacket, Carin Wester, Denim, emerson fry by Carolina Engman. Bookmark the permalink. I love black and blue combo! You look relaxed yet chic. This is so lovely (as always!) I adore that jacket. Such a great outfit in its simplicity!! I’m in love with those boots, can’t stop staring at them in your posts!!! Simple and beautiful! Love this mix! the jacket is amazing! also love your sunnies – I also had a pair of Audreys is tortoise but I lost them at the airport last summer! it still breaks my heart to see them on other people haha! Simple buy oh so chic! Great outfit, love that bomber very stylish! Cute!! loved the bomber and the boots!! Beautiful, it’s a perfect outfit against the cold! Carolina, what’s that? No offense I’m your long time reader, you’re still very beautiful but that’s a strange outfit. That bomber is sooooo great! Love that bomber jacket! I love keeping it simple too! Well, simple means elegant, classy !! So nicely done!!! Although the jacket would be a little bit out of my comfort zone, it looks great on you !! I love it. Stunning and very stylish outfit! Your hair look’s amazing too! Please have a look on my fashion blog sometimes! looks so nice. love the jacket . it is simple but look amazing! Love the look, you are gorgeous !